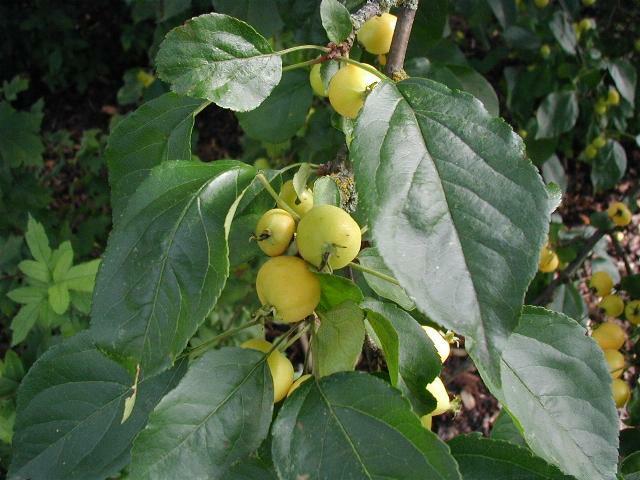 Malus baccata is a tree to 14 m (usually much smaller), slender, twigs smooth. Leaves alternate, elliptic to egg-shaped, tip long pointed, base rounded to wedge-shaped, often hairy below, especially when young, margin finely toothed. Flowers white, about 3 cm wide, sepals hairless, lobes long-pointed, stalks 2-4 cm. Fruit fleshy, red or yellow, rounded to 1 cm wide, calyx deciduous, persistent into winter. Frost often turns fruit bright, translucent red. Habitat: Escapes in old fields, roadsides, second growth woods, edges or found in overgrown horticultural plantings (many horticultural hybrids and cultivars). Similar to P. malus which has a persistent calyx. Notes: For other Malus spp. See Pyrus malus.